During a tish, the Rebbe sits at the head of the table and the Hasidim gather around the table. In large Hasidic movements, only the Rebbe and his immediate family, plus a few close disciples, partake of the actual meal, but small pieces of bread, fish, meat, poultry, farfel, beans, kugel, or fruit, as well as small cups of kosher wine or other beverages, are distributed to all present as shirayim. If you know this melody please contact me! Lorin Sklamberg pointed out to me that the structure of this song is very much like that of "Khsidemlekh Zingen" which was also by Yosele Kolodny. Perhaps he used the same tune for both. 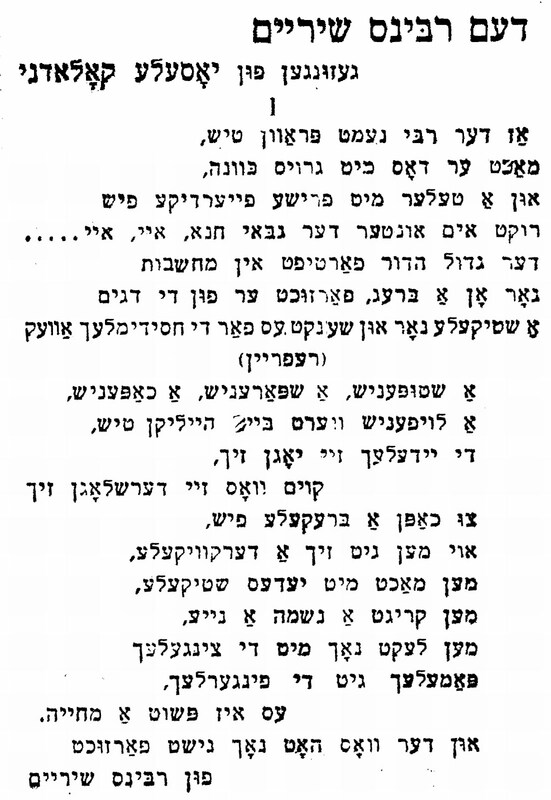 It reminds me of the song "Der rebemit di khasidim" in Vinkovetsky, vol.3, p.114 - which pokes fun of the shirayim.